If you could compare a hook in popular music to a drug, you would probably want every single hook on The Fratellis debut album, Costello Music, injected directly into your veins. Listening to Costello Music is all but guaranteed to get your juices flowing, with its thirteen song set being nearly non-stop raucous fun. No track on the Fratellis’ debut clocks in at more than four minutes, making each song perfectly digestible without any second thought, or any risk of over-analyzation. The biggest hit on here, “Chelsea Dagger,” strikes loud and clear, combining a rollicking sing-along with ringing guitars, making it sound larger than life; its success hinges on grabbing the listener’s attention, and it has no trouble accomplishing this task. Likewise, the T-Rex styled made-for-air-guitaring riff in “Baby Fratelli,” rips and then bounces jubilantly along. It is all as immediate as anything you have ever heard out of rock music before. Instrumentally, there are very few chances taken or excursions from the main formula of the record – aside from the horns that open the album on “Henrietta.” Like any great rock record, the balls to the wall electric guitars are placed at the front, the melody is emphasized by the bass bouncing alongside, and the drums hit hard, fast and heavy. That’s not to say that Costello Music is a stale record. Though the majority of the tracks have the same sort of idea behind them, the life that is pumped into all the songs on here by the Scottish trio takes the music above and beyond any expectations. Take for example one of the slowest songs on the album, “Whistle For the Choir.” It opens with softly strummed acoustic guitars alongside John Lawler’s torn, raspy and simultaneously melodic voice, and, yet quickly evolves into a different beast – catchy, yet passionate thanks to a whistle and banjo solo. “Doginabag” also stands out as being different from the rest of the album in that it’s a slow, sweltering, blues driven slow-burner, but it promptly summarizes the album’s sentiment with the line: “There’s nothing really going on out here/I’m holding on for dear life and one more beer.” Despite it being one of the more forgettable tracks, this sort of laid-back attitude (in both the lyrics and the performance) is what makes Costello Music a great album instead of just a collection of snappy songs. It is unpolished – to call it lazy or lackadaisical would be missing the point – in fact, all three members play with the sort of drive that brings the music to life. The Fratellis are not the tightest band you have ever heard, and yet, this album is all better for that very reason. 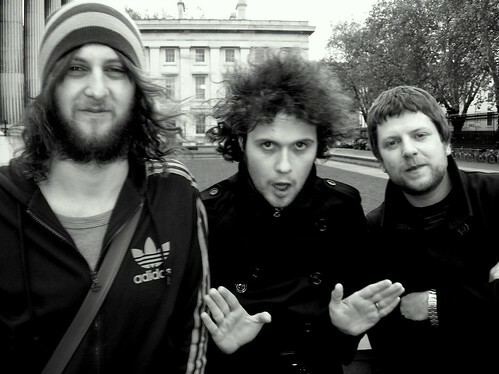 The Fratellis, just three rambunctious lads from Glasgow. It might sound like the band and the album are on the verge of completely falling apart, but, instead, the Fratellis hold it all together and bring nearly every track to the brink without having the songs disintegrate into a nonsensical mish-mash of sounds. Lyrically, the album is, in comparison to other records of the time, a mess, but again, the album ends up being better for just that reason. Case in point: often times, the band resorts to sing-a-long “ba da da’s” (“Flathead”), “wah-ah-ah’s” (“Henrietta”), “la-la-la’s,” (“For the Girl”), and even sometimes throwing in a few “do-do-do’s” (“Chelsea Dagger,” “Ole Black n Blue Eyes”) with some handclapping thrown in for good measure to drive the point home. At the end of the day, it does not really matter what they are saying, it is the manner (or lack of) in which they are saying it. The lyrics on Costello Music are not meant to be inspirational, political, or drive any sort of intellectual discussion, instead, they are just meant to accompany the rowdy music, and inspire pub sing-a-longs about loose girls and the next pint. “Got Ma Nuts from a Hippie” exemplifies this theme most clearly, with it being a song about losing your virginity “in a camper van on a Saturday night” before (literally and metaphorically) exploding at the end. All of this adds up into an album that is well worth its forty four minute running time, and a band that brought a time-tested and simultaneously unique sound to the table without sacrificing anything. It is not that the Fratellis were doing anything life-altering or radically different, or pushing the boundaries of music of the time on Costello Music, instead, they were doing just the opposite – sticking to what was popular and driving it forward in their own unique, exciting way, and in the process, they created one of the most high-energy, rousing, and exhilarating albums of their time. Back in the fall of 2013, after releasing their first new album in five years, I finally got to see the Fratellis at the Paradise Rock Club in Boston. It was during the middle of some tough times for me, so I got there early and completely let go/lost my mind. They played all their best songs, and I sang along to every goddamn word. I still think it was one of the top five shows I’ve ever had the pleasure of attending. After the show, I got to meet all three members of the band, with the drummer Mince noting that he not only saw me at the front, but that he saw that I knew every single word and drum fill to their songs. Maybe he was just placating me, but that still meant a lot to me that he saw how much their music meant to me. Your humble narrator with the Fratellis: Mince (drums), Jon (guitar/vocals), and Barry (bass) (from top right clockwise). Starstruck doesn’t even begin to cover it. The Fratellis are back on tour this spring, and I’m looking forward to seeing them again. I’m in a much better position (and a bit older and wiser) than I was four years ago, but you’ll still find me there, at the front, still shouting along to every lyric.